Though many of us have been taught that studying longer means studying better, numerous studies have proven otherwise. Really, the longer you try to study in one sitting, the more likely it is that you will get distracted by your phone or the internet. 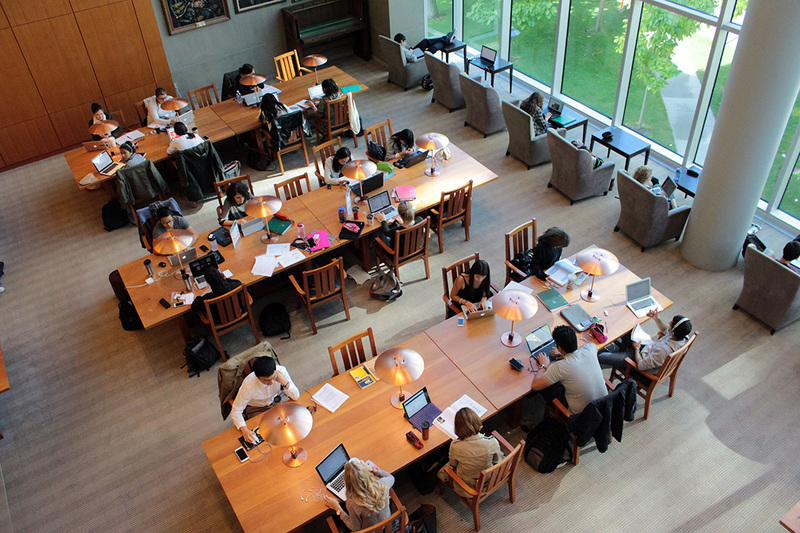 The American Psychological Association states that numerous short study sessions spread out over multiple days or weeks will improve your retention of information. Additionally, if you study at the same time every day or every week, your studying will also improve as your brain will get into a routine and be more prepared to learn during those intervals. Studying in short bursts has been shown to increase focus and improve the quality of your study sessions. By giving yourself frequent breaks you keep your mind fresh, but are also more likely to use your time effectively if you know that some time to relax is coming soon, so make sure to leave your phone and the internet aside until your break. One great way to manage your study time is with the Pomodoro Technique , where you study for 25 minutes and then take 5 minutes off. By studying in 25- 30 minute chunks about 20 times a week, you will improve your long term retention of the material you are studying and will avoid burnout. If you study at the same time every day or every week, your studying will also improve as your brain will get into a routine and be more prepared to learn during those intervals. What is the most effective study method? If you leave your exam preparation to the last minute, cramming becomes a necessary evil. However, it is often linked to the lowest grades as staying up all night studying has been shown to seriously impact memory and reasoning skills. Making sure you leave enough time to adequately prepare for an exam is key to your success. If you need some help, check out our toolkit on time management or for more study tips go here. If you just re-read your notes, you aren’t actively engaging with the content you’re studying. While reading over your course notes is a good starting point and needs to be done throughout the semester, you must ensure that you are retaining the knowledge you are reading by creating connections and improving your understanding of key concepts. Some good ways to do this are by doing practice exams, creating flashcards or discussing key concepts with your classmates. 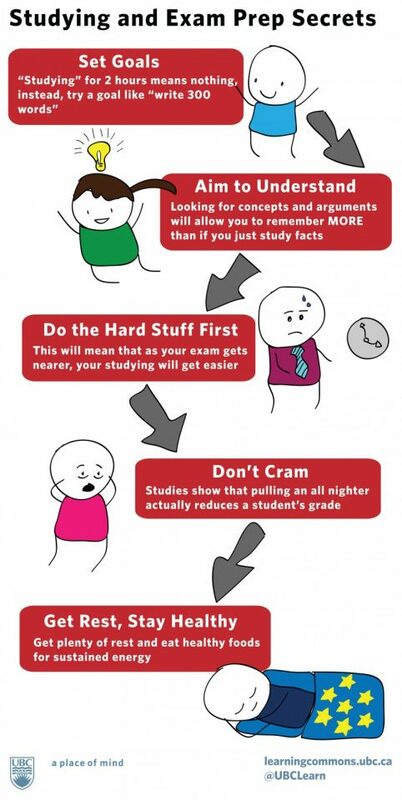 For more study tips go here. Other good ways to study effectively are doing practice exams, creating flashcards or discussing key concepts with your classmates. Flashcards are a great way to review material and to test your memory as they use repetition to engage your active recall of information. What makes them even better is that they are portable, so you can use them anywhere and at any time. Who knew that time on the bus could be used for more than scrolling through Instagram? Old exams are great practice before the real thing. Looking for old exams? Check here for math and law resources. However you should never assume that old exams will include the same material or ask the same type of questions as yours will. Be sure to check with your professor as to the structure of your class’ exam so that you do not spend all your time practicing the wrong types of questions. When taking practice tests, make sure to leave your notes and textbooks to the side. By simulating a real exam environment you will better see what you understand well and what you need to devote more study time to. If a practice exam isn’t available you can make your own questions from your notes and assignments. This will help you recall material, build connections and identify important course themes. By taking what you know and teaching it to someone else, you will improve your understanding of key concepts because you’ll have to explain them coherently and concisely. By sharing your knowledge it will be easy to identify which concepts you are still struggling with and have trouble explaining, and those which are second nature. However, if no one is willing to be your teaching guinea pig, more study tips and strategies can also be found here. Reviewing your syllabus is a great place to start. Many professors will include exam information on their syllabus, as well as a summary of the key concepts that students are expected to learn. However, you need to know if the exam questions are going to be pulled from lecture material, assignments, readings or all of the above? Is the exam cumulative (does it cover everything since the first class)? If you're unsure, the best way to determine what will be on your exam is to speak with your professor for clarification. For advice on speaking to your professor visit our toolkit on Interacting with profs . While practice exams are a great study method, there is no guarantee that the material covered on the test, or the type of exam questions will remain the same from year to year. You need to know if your exam’s questions are going to be pulled from lecture material, assignments, readings or all of the above. Is the exam cumulative (does it cover everything since the first class)? If you're unsure, the best way to determine what will be on your exam is to speak with your professor for clarification. As the person who wrote the test, your professor is the best source for finding out what content the exam is going to cover and what types of questions will be asked. If you need some help with going to talk to your prof about the exam, see our toolkit on Interacting with profs . In order to get the most out of your study sessions be sure to set specific goals for each session. It is often best to focus on one aspect or concept and to study it in depth before moving on to something else. Make sure to set S.M.A.R.T goals so that you are able to attain them. By studying the most difficult concepts first, you will increase your confidence and everything you study afterwards will seem much easier and manageable. While it often seems easier to avoid the difficult stuff and leave it right to the end, this will increase your panic and won’t make for effective studying. Overall in order to get the most out of your study sessions be sure to set specific goals for each session. It is often best to focus on one aspect or concept and to study it in depth before moving on to something else. Make sure to set S.M.A.R.T goals so that you are able to attain them. Overall, when studying it is important to give yourself breaks and to take time to have fun and to socialize so that you don’t get too overwhelmed. If you need help with your health and wellness this exam season check out Stress Less for Exam Success. Tell us what you think of the Preparing for Exams Toolkit. Please select a response.